These Cheesy Chicken Fritters are a deliciously flavorful and keto-friendly meal or appetizer! 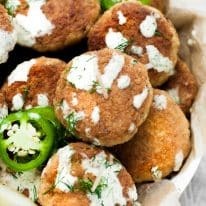 This recipe is low in carbs, super simple to make, and a great make-ahead option as the fritters and Spicy Lemon Aioli store perfectly in the refrigerator all week! Like that of my Chicken Bacon Ranch Poppers, Spicy Salmon Poppers, and 10-Minute Spicy Tuna Rolls, these Cheesy Chicken Fritters are great for holiday parties or family gatherings as they are easy to serve and are perfectly bite-sized! 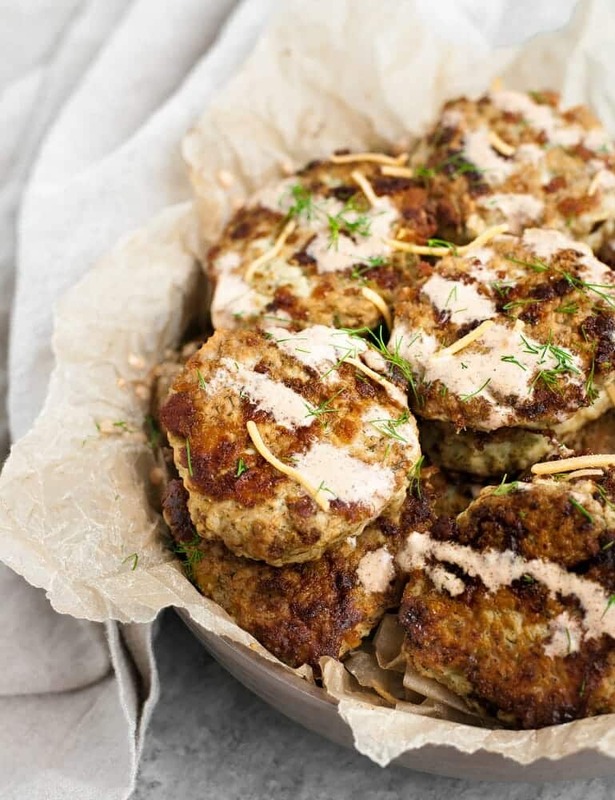 To further elevate these fritters, you can serve them with a Spicy Lemon Aioli that will add a little heat and citrus with each bite! 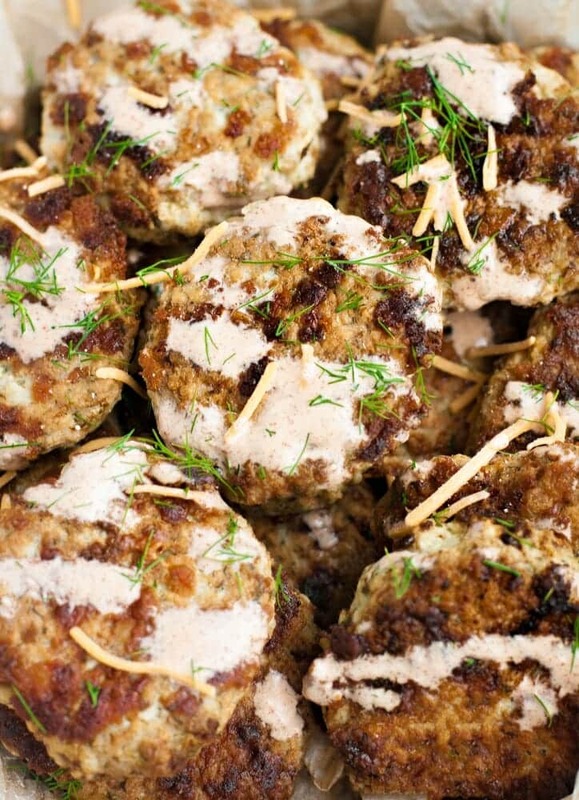 We love to pair aiolis with bite-sized appetizers like this one for an extra burst of flavor and an added taste-component! If you are unfamiliar, aiolis are just simple mixtures of mayonnaise, garlic, and any additional ingredients you think would pair well with your main dish. Aiolis are excellent as dips, sauces, or salad dressings! 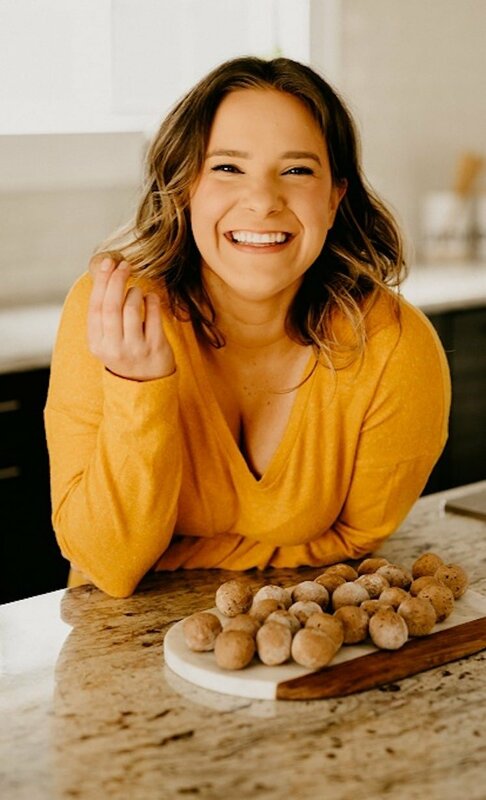 In addition to aiolis adding flavor, they are also a great addition to your ketogenic diet as they contain minimal carbohydrates and provide you with a dose of essential healthy fats! 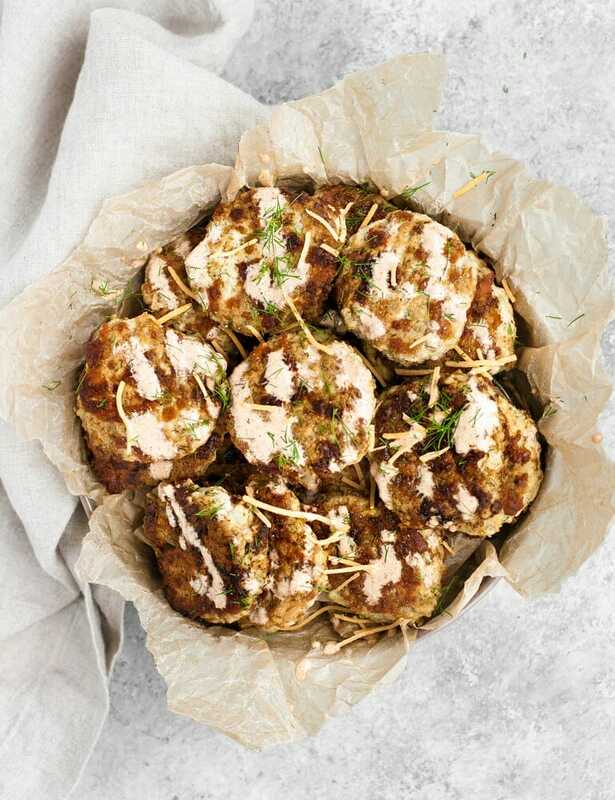 These Cheesy Chicken Fritters with Spicy Lemon Aioli are a great recipe choice to have on-hand for parties that you plan to bring a dish-to-pass to, especially those events where attending guests have diet- or allergy-restrictions! Keto and Low-Carb: These Cheesy Chicken Fritters are ultra low-carb and keto-friendly! One fritter served with aioli contains only 1 gram of net carbs! Nut-Free: This recipe is entirely nut-free and is therefore safe to consume for those with nut allergies or nut intolerances. 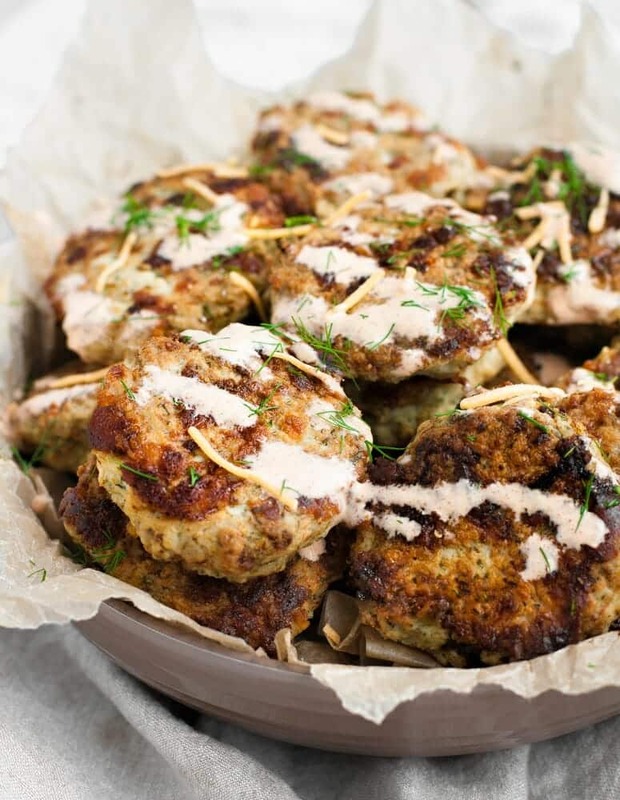 These Cheesy Chicken Fritters served with Spicy Lemon Aioli contain only 1 gram of net carbs per serving! The recipe yields 18 fritters. 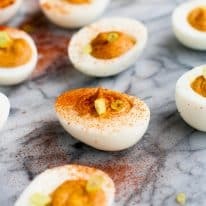 This recipe is keto, low-carb, nut-free, coconut-free, gluten-free, grain-free, and sugar-free. These Cheesy Chicken Fritters are a delicious keto-friendly party appetizer! They are full of flavor, low in carbs, and super simple to prepare! 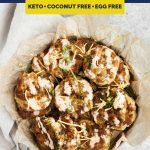 This recipe is keto, low-carb, nut-free, coconut-free, gluten-free, grain-free, sugar-free, and contains only 1 gram of net carbs per serving! Chicken Fritters: To large mixing bowl, add ground chicken, eggs, pork rinds, mayonnaise, mozzarella, cheddar, and spices and mix until well-combined (an electric or stand mixer works well for this). Over medium heat in a large pan, heat avocado oil. Scoop out 1-2 tbsp of cheesy chicken mixture, place in heated pan, and lightly press down with back of spatula. Cook fritters for 4 minutes on one side, flip, and cook for 3-4 minutes on opposite side. Transfer cooked fritters to paper towel-lined plate and allow to cool. Spicy Lemon Aioli: Add all ingredients to small bowl and whisk until fully combined. Serve atop fritters or as a side dipping sauce and add optional garnishes as desired. 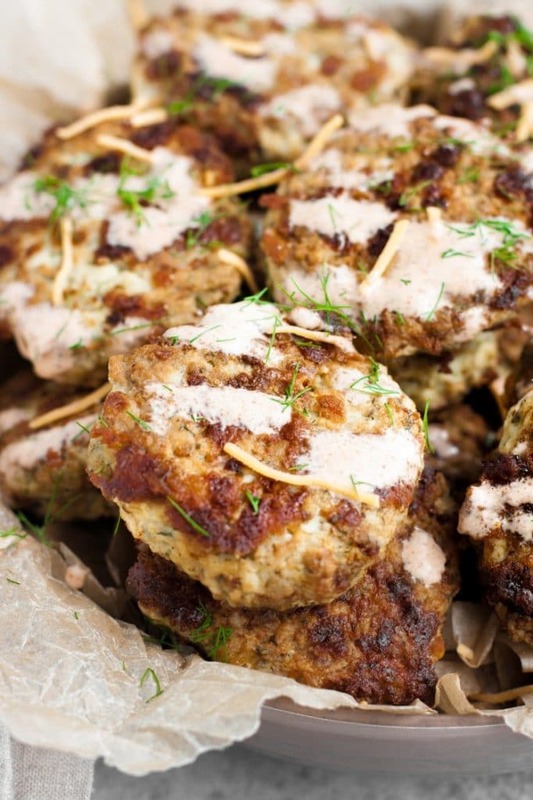 Store fritters and aioli in separate airtight containers in the refrigerator for up to 5 days. Hi, Cathy! You could try omitting them altogether and adding another ~1/4 cup shredded mozzarella to serve as a binder. The purpose of the pork rinds is to keep all of the ingredients together so, additional cheese may do the trick! I just made these for lunch using leftover rotisserie chicken. You got rave reviews from my husband. He’s decided this low carb/Keto isn’t so bade after all. Thank you! What is the corresponding measurement (Tbps or cup) of the 3 oz of mozzarella and 1 oz of cheddar? Hi, Kimberly! 3 ounces of mozzarella is 6 tbsp and 1 ounce of cheddar is 2 tbsp.